OSWEGO — SUNY Oswego’s GENIUS Olympiad will feature several opportunities from June 25 to 28 for the public to enjoy the work, cultures and enthusiasm of more than 400 high school science, art, writing and design competitors and their mentors from around the nation and the world. Kunal Sangani, a Fayetteville-Manlius senior and GENIUS Olympiad finalist. Free public events at the second annual environmentally focused competition will include an exhibition of projects and research posters, an opening ceremony featuring National Geographic photographer and Antarctica documenter Maria Stenzel, the first “Learning and Mind Symposium,” an international cultural fair, a college fair and workshops, and the colorful closing awards ceremony. Sangani, who has done scientific research for three years, said hydraulic fracturing of gas-bearing shale attracted his interest because it is of “huge importance” in Upstate New York. “I was intrigued by the environmental issue, and after having experience in the lab from previous projects, I decided to apply the skills and techniques I had learned to this issue,” he said. A free public exhibition of the projects and reception for the students and their mentors will take place from 6 to 7:45 p.m. June 25, in the Campus Center arena. In April, a panel chose 248 projects as finalists among more than 650 submitted. 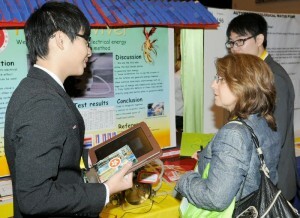 SUNY Oswego adjunct professor of biological sciences Cleane Medeiros, center, asks Ching Tin Fu, left, and Ho Hoi Ming Ivan of Hong Kong about their research on producing electricity from wasted heat at the college's inaugural GENIUS Olympiad in June 2011. 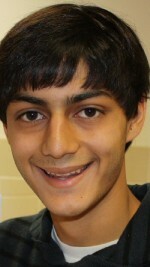 More than 400 high school-age competitors, mentors and parents from around the world are expected to arrive Sunday, June 24, at SUNY Oswego for the 2012 GENIUS Olympiad environmental science, art, creative writing and architectural design competition. Finalists hail from 49 countries and 32 states. About 415 competitors, mentors and parents have said they will make the trip to Oswego, according to Fehmi Damkaci, founder and director of GENIUS (Global Environmental Issues — U.S.). A sampling of projects whose authors have committed to attend include “Protection from the Injuries of Metal Nanodusts and Deriving Benefits from Their Properties” by Azerbaijani students Vali Valizada and Sehavat Haydarli, “Decreasing the Ozone Pollution of Photocopy Shops by Using the Plant: Evergreen” by Vietnamese students Nguyen Nhu Thanh Thao and Nguyen Hong Ngoc, and “Thermal Insulation Particleboards from Transparent Wastes and Tropical Fruits’ Peels” by Thai students Ihsan Gurbuz and Thu Zar Htun. At 8 p.m. June 25, National Geographic’s Stenzel will deliver the keynote address of the GENIUS Olympiad during the opening ceremony in Tyler Hall’s Waterman Theatre. In 17 years with the magazine, including the last five as part of the “National Geographic Live!” speaker series, Stenzel has documented indigenous groups from tropical rainforests to the Arctic. One region that keeps calling her back is Antarctica, the frozen underworld of big seas, ice and a large concentration of wildlife. June 26, will witness the first “Learning and Mind Symposium” from 9:30 a.m. to noon in the Campus Center auditorium, featuring experts from Harvard, Cornell, Syracuse and SUNY Oswego speaking on how learning takes place. That evening, a kaleidoscope of native costumes and traditions will color the Campus Center arena from 6:30 to 8 p.m. as competitors and their teachers/mentors present an international fair. The Olympiad’s final full day, June 28, will start with SUNY Oswego and 18 other Central New York institutions of higher education presenting a college fair and workshops from 9 to 11 a.m. along the Campus Center concourse. From 11 a.m. to 12:15 p.m., the final game of an eight-team basketball tournament will take place in Laker Hall. The awards ceremony — with many flag-waving participants again in dress native to their lands and cultures — will take place from 1:30 to 3 p.m. in Waterman Theatre.